“Choose a job you love and you will never have to work a day in your life.” We have all heard this statement many times and have inadvertently made a mental note to assess what we do for a living in comparison to this ideal. Although Confucius probably didn’t mean this literally, the focus of the statement holds some serious flaws. It implies that somehow “work” is something to be avoided and those jobs that people love could not possibly involve hard work. When did the term “work” become a four-letter word? 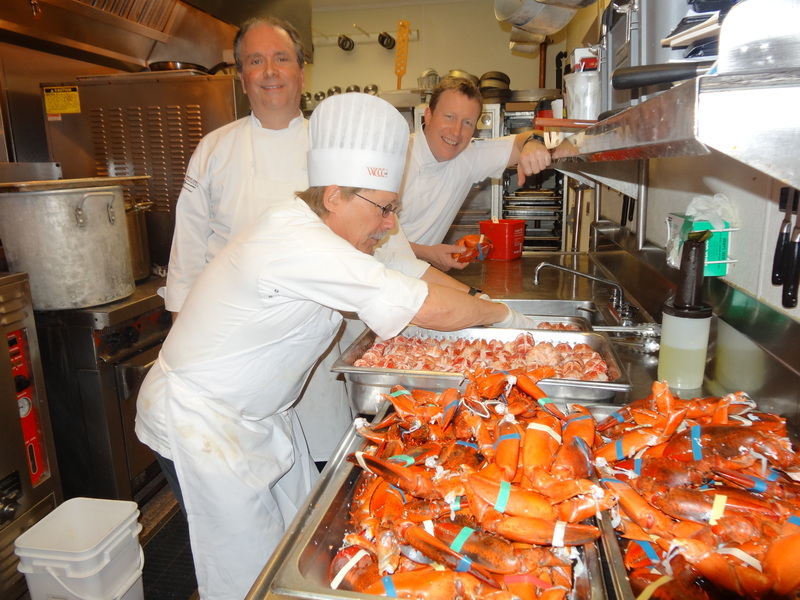 What cooks and chefs realize is that the job they love is enjoyed because of the work. Those who find themselves in a professional kitchen thrive on the physical, mental, and emotional “work” associated with the job they have chosen. This is why they are there, day in and day out, on their feet, under extreme heat, bending, lifting, calculating, and pressing forward under the weight of a demanding prep list. Like football players who find comfort in an ice bath after a tough game, cooks, for some reason, enjoy those aching muscles and battle scars that prove what they have accomplished in a day. Now this love of accomplishment and attraction to the pains of hard work is not unique to just cooks and chefs. There are hundreds of careers that demand the physical, mental and emotional commitment that we experience in kitchens. These careerists, like cooks, love what they do and realize that the “pain” of work is what drives their engines. One of my favorite shows on TV is Mike Rowe’s “Somebody’s Gotta Do It,” on CNN. Mike is a champion of the working stiff, the person(s) who allow everyone else to enjoy their days and nights, the people who look at work as a privilege and an opportunity. What is most interesting about this show is that no matter how obscure, or in some cases unthinkable the job is, those involved seem to love what they do. It is WORK that helps to give substance to a person’s time on earth and helps to define the kind of person they are. When I watch that show, as is the case with many others I am sure, the first reaction is usually to note that the job in question is something that I would never want to do. Yet, people do those jobs, by choice, and many seem to truly enjoy it. As I grew up, there were many friends and family members who wondered why in the world I wanted to work in a kitchen. The work is hard, the hours are ridiculous, the pressure of timing and quantity seem to be incomprehensible, and the pay is not all that great. “You are never home for the holidays or weekends!” How many times have you heard this from your network of friends and family? When outsiders consider what the tools of the trade for a chef and cook might be, they invariably refer to knives, pots and pans, and the gadgets that they might find in a local Williams and Sonoma. When you ask a cook to consider what their most valuable tools might be, they will also include: supportive shoes, Johnson’s Foot Soap, Ibuprofen, and Mineral Ice. The knives allow them to perform once they are in the kitchen; the other tools help them through their hours at home and give them the opportunity to return for another shift. Working with food is “work worth doing” and every serious cook understands this. Each meal that a cook commits his or her time to provides nutritional sustenance, but more importantly, provides happiness and reward to those who choose to spend an hour or so in a restaurant dining room. When I look at all of the great people who I have shared kitchen space with, there are certainly some who punched a clock to earn a paycheck, but more than I can count were there because they couldn’t imagine doing anything else. These are the cooks, bakers, chefs, and even dishwashers who get charged up every time they walk through those kitchen doors. These are the folks who only feel complete when they are sore from working a long shift, putting out excellent food, pushing through a full board of dupes, and beating last nights guest count without any complaints. A work of fiction that follows the careers of two cooks and their adventures in Buffalo, New Orleans, The Adirondacks, New York City and Vermont. Everything is great until the Event changes their lives. Look for the book through amazon.com and iUniverse.com some time in late 2014 or early 2015.